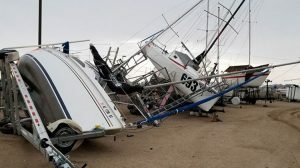 Two storms on Friday and Saturday night (7/14 & 7/15) blasted Lake Pleasant, churning the lake, ripping up docks and hurling boats into each other. Bruce Andress reports Monday (7/17) that Pleasant Harbor Marina is closed to the public and has very extensive damage, enough that he says repairs will run into the millions of dollars. Besides the private boats damaged, Bruce says that the AYC pontoon boat was blown some 30 yards by the wind, skittering across the economy storage lot and ramming into a cabin cruiser. The AYC boat has some damage, mostly to the trailer, and the cruiser has a hole in the side. 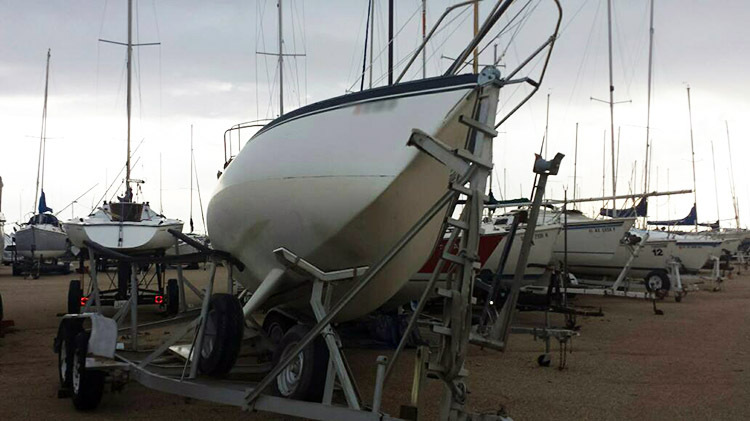 On Friday night, a reported 160 boats were damaged at Scorpion Bay Marina and docks were trashed. The marina closed Saturday except to members sorting through the damage. Many of the boats had been scarred by bashing against the docks. Power boats that were tied with sterns to the dock had banged into the docks until fiberglass broke and crumbled. As of 6 o’clock Saturday night, the power was still out. Rear Commodore Sharon Bell’s boat had a puncture wound on the port side, a damaged bimini and broken stanchion, but came out better than boats nearby when her dock came adrift. The dark clouds of another monsoon storm formed Saturday afternoon, clearing boats off the lake as high winds, surging water, and heavy rain banged against the marinas. This time the heaviest damage was to Pleasant Harbor Marina, where the walkway to the marina was wiped out and boats in the dry storage area were toppled. The boat belonging to Dave Christensen and Wendy Larsen was knocked over. Rick Johnson’s boat was damaged. Steve Kusic’s boat was knocked off the trailer. Wendy added that there were three holes in the hull of Dog Years and that 9 boats were knocked over.